Brian and his drummer bandmate Roger Taylor will be joined by former American Idol singer Adam Lambert at their first headlining performance at Knebworth Park, 26 years after Queen's final concert with late frontman Freddie Mercury in August 1986. "I think all the vibes will be good. I think the feeling about Freddie will be good, and I think if Freddie was around, he'll approve of what we're doing, because it's interpreting those songs and those songs should live," he said. 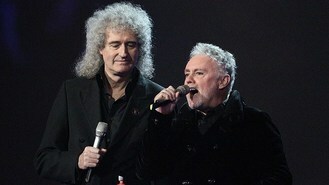 "A lot of those songs are Freddie's and we've got a great interpreter there, so I'm looking forward to it. It will be challenging, yes it would - my God, it will be challenging - but you've got to set yourself big hurdles to get over really. That's what life is about," he added. Roger admitted to having mixed feelings about the gig: "Well really, we don't know until we play there. It's a big challenge for us, come around in that complete circle. "I do remember the sound being absolutely fantastic there when we played all those years ago with Freddie, for his last ever show with us, and I just hope we can come somewhere close to that with Adam Lambert, who is a phenomenal singer and an absolutely amazing talent." Kiss are set to headline on July 6, while Faith No More will close the festival on July 8, with Marilyn Manson and Evanescence also performing.